Kammarton invariably follows its corporate social policy aimed at protecting the environment, the quality and the safety at work. In this regard, the company is proud to announce its new Integrated management system that takes into account the requirements of three international standards - EN ISO 9001: 2008 for a quality management, EN ISO 14001: 2004 for an environmental management and OHSAS 18001: 2007 for an occupational health and safety management. The system was developed and implemented in stages in all activities of Kammarton since the beginning of 2015. 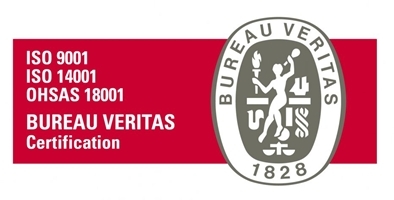 At the end оf July 2015 successfully passed audit according to the specific requirements of three international standards and the received certificates of conformity by the Bureau Veritas Certification Bulgaria mark a new stage in the development of the organization. The aim is to constantly increase the efficiency and quality of the work, while provided healthy and safe working conditions and minimizing adverse environmental impacts. The management and all employees are committed to the continuous improvement of the system in all these aspects.